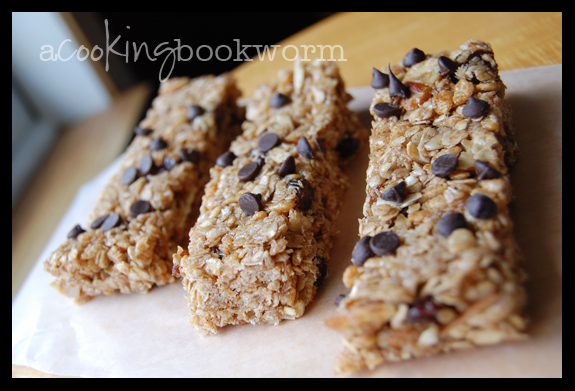 I've been making homemade granola for a healthier snack for several months now. 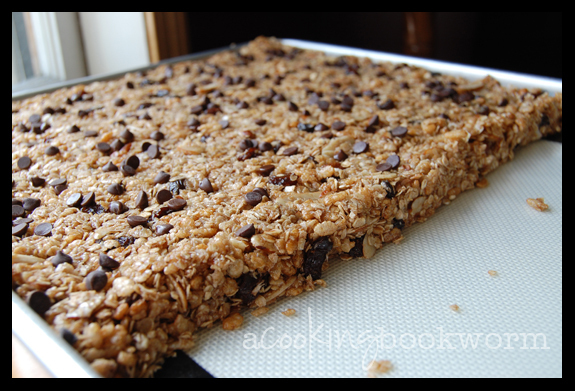 Since then, I've had granola bars on my to-make-someday list, and finally got around to making them today. Since we're trying to cut back on the sugar, I debated trying to sub out the brown sugar, but I knew that was what helps make the bars hold together, so I left it in. Even with the sugar, these bars are healthier than storebought, but have that same soft, chewy texture. Best of all, in my opinion, they are much tastier than anything a factory can churn out! Stir well. Pour sugar mixture over dry ingredients and mix well to completely moisten. Pour mixture into a lightly greased jelly roll pan or cookie sheet with high sides. Press granola to be about 3/4 inches thick. Press granola firmly, so bars will hold together. You will likely have a bigger pan than you need (see picture right). Just press mixture to one side of the pan. Press down lightly. Cool bars completely (about 2 hours) before cutting and storing at room temperature. These were an absolute hit in our house!! I see all kinds of great variations in the future -- craisins and white chocolate chips. Peanut butter into the sugar mixture. Mmmm....! Let me know if you try them or share on Pinterest!